I've been a fan of Todd Rundgren ever since the first Nazz LP came out in 1968 and I always will be. His solo debut, "Runt," is still one of my all-time sentimental favorites and I've collected seven or eight of his albums over the course of his illustrious career. 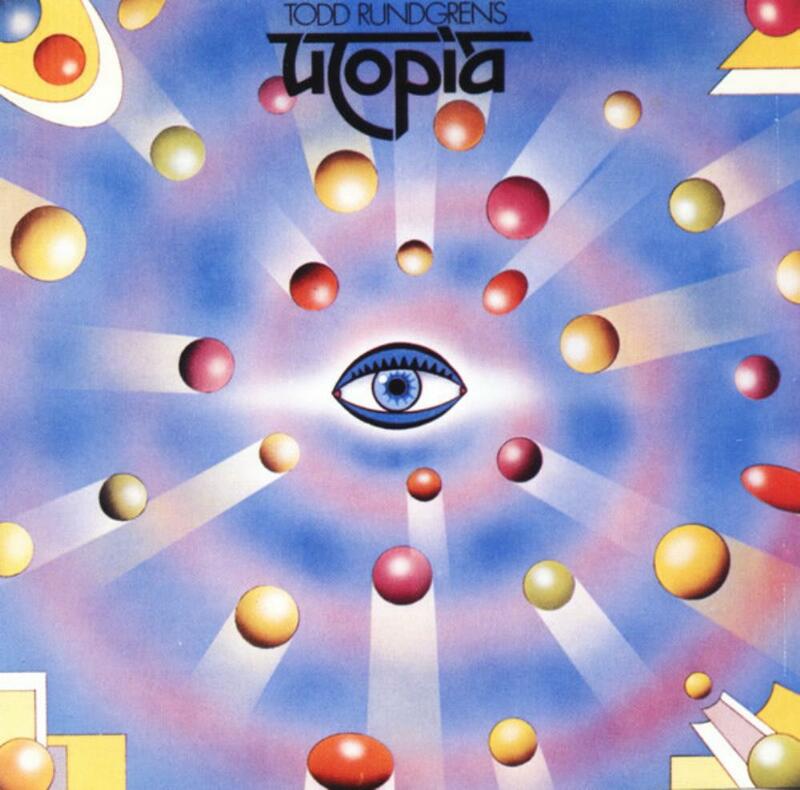 So it shouldn't be a surprise to learn that in 1974 when I heard that Todd had assembled a new group called "Utopia" (with not one or two but three keyboard men!) and that they intended to lean in the jazz rock/fusion direction I could hardly wait to get the shiny black vinyl on the turntable. I couldn't have been more pleased with the opening song that shares the band's name. Recorded live at the Fox Theater in Atlanta, it has all the necessary ingredients to qualify as an epic, progressive behemoth. There's a full-scale salvo to get things started that evolves into a rolling drum rhythm, then into a straight rock beat behind a stirring, upwardly mobile chord progression. You get a savory taste of synthesizers and organ before the verse commences, featuring Rundgren's unmistakable voice. An anthem-like movement takes you through a repeat of some of the parts, building steadily towards an emotional, frenzied end. With Todd's passionate guitar leads being exceptionally awesome, it's far and away the high point of the album. The downside is that they never reach that lofty plateau again. The remaining three songs are studio recordings and, unfortunately, the group's lack of cohesion can't be glossed over. "Freak Parade" isn't terrible but after listening to the spirited liftoff that is "Utopia" it pales in comparison. It has a tangible, satirical Frank Zappa influence and Rundgren lays down some David Gilmour-ish slide to get it airborne but when he starts singing it loses altitude in a hurry. There's a creepy laughing synthesizer effect, some general weirdness and a lone bass line that trails off into oblivion at the end for no apparent reason. This song more or less reflects the overall problem here. They have a lot of ideas and pieces that just don't fit together. Moving on, "Freedom Fighters" is an okay rock and roll tune but the loose drums are clumsy and Todd sounds like he's hollering the words more than singing them half the time. Another glaring blemish on the project is this. Despite the fact that the engineering, mixing and production are all supervised by the well-respected and very knowledgeable studio rat himself (Rundgren); the sound quality on all but the first song is amateurish, atrocious and inexcusable. Whatever happened to high fidelity, Todd? This brings you to the closer, "The Ikon," that clocks in at a healthy 30:22. It's better than the last couple of tunes but it's also a blend of good and not-so-good moments. The Mahavishnu-inspired riff at the outset is not bad at all and the keyboard and guitar rides are inspirational. But when they tap into a funky and then a disco beat underneath Rundgren's thin vocals the momentum gets buried. Even Todd's game attempt at some smooth falsetto lands short of the mark during one of the song's quieter spells. A wild jam session ensues with every member of the six-piece group getting several turns in the spotlight as they go 'round the horn a few times. But instead of thrilling it's just way too busy and some of the synthesizers sound strangely like old Farfisa electric organs from the sixties. Things improve afterwards with a more serene section that introduces a new melody. It's a decent detour but it comes off like it's a leftover from one of his previous solo efforts and seems a little out of place here. They transition to a whimsical but engaging "Hoe-down" segment that is played once at normal speed, then after a brief piano/guitar interlude, is re-introduced at almost double-time tempo. If they'd stopped there it would have been preferable to the sloppy mesh of multiple instrumentations that crowd their way into the finale. I get the feeling that it was all arranged too hurriedly and could have benefited from some much-needed editing. The 800 pound Gorilla in the room here is the fact that when a band steps into the "fusion" ring they'd better be ready to take on the heavyweight division boxers (i.e. Return to Forever, etc.) and these guys weren't in fighting condition. I was disappointed with this album in '74 and I still feel the same way now. No one wanted Todd to succeed with "Utopia" more than me and I have to give them the proverbial "E" for effort but, in the end, I have to say this was admirably adventurous but ultimately mediocre. 2.9 stars.